View a sample of vLog's IQOQ document. 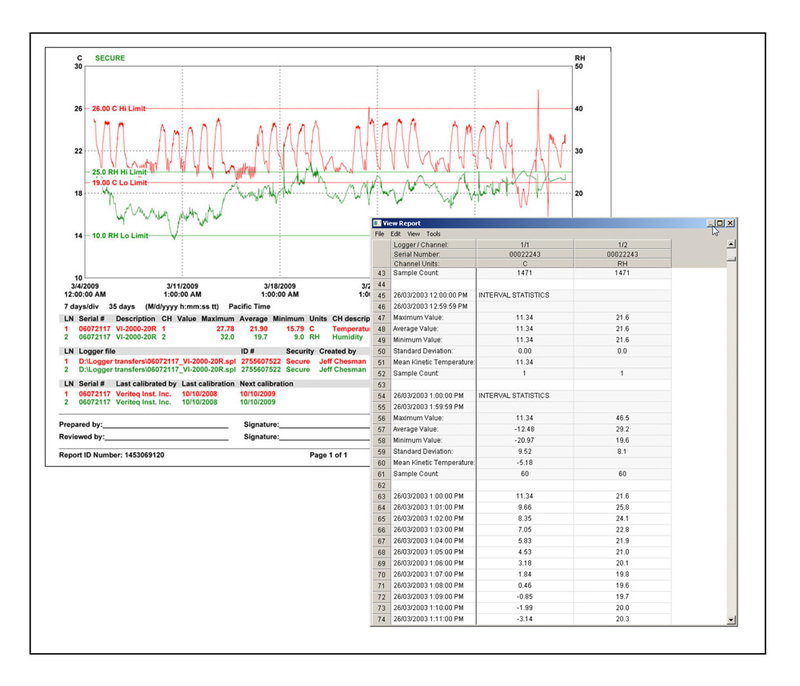 Display temperature and humidity on one or separate graphs. User-configured limit lines give a quick indication of study results. Use vLog's template reports or configure your own, including: statistics, minimum/maximum/average values, mean kinetic temperature and other calculations, or export generic .csv files for further analysis. ​Small, thermistor-equipped data loggers are easy to place and won't interrupt normal operations during validation studies. Simply place the loggers, run the software, and begin mapping. The data loggers' onboard memory, long-life battery, and stable temperature and humidity sensors let you focus on test results, instead of time-consuming setup and re-calibrations. With a validated audit trail, no action within the mapping system is unrecorded. Data is secure and tamper-proof, ensuring reports comply with 21 CFR Part 11 and Annex 11. For added security and simplicity, the vLog VL software uses your existing password authentication to integrate enterprise security features into your mapping studies. The Vaisala mapping kit is a reliable, easy-to-use alternative to thermocouple-based equipment, bulky data acquisition systems, and less robust data loggers. Ideal for stability chambers, refrigerators, freezers, incubators, warehouses, ambient environments and other demanding studies, the kit ensures secure and accurate profiling of environmental conditions. The mapping kit comprises Vaisala vLog VL software, the vLog IQOQ, and your choice of Vaisala's highly accurate data loggers. The software is secure and easy to use and the data loggers are equipped with Vaisala's industry best sensors. With superior accuracy and minimal long-term drift, the mapping kit provides confidence in study results. Stable sensors eliminate the need to re-run studies, do time consuming pre- and post-calibration, and open multiple deviation investigations. See report samples. Large onboard memory allows mapping studies of almost any length. Compact, battery powered loggers mean no complex wiring or lengthy setup. All files are encrypted and reports are 21 CFR Part 11 and Annex 11 compliant. Optional IQ/OQ protocols are a time-saving solution to system validation. Batch set-up, download, and audit trail filtering make report analysis fast and easy. Localized versions of vLog software are available in Chinese, Japanese and French. When the mapping study says move the probe, do you need other criteria to relocate? Sensor Breakdown for Chambers Vs Room Monitoring: What Sensors are best for Your Application?